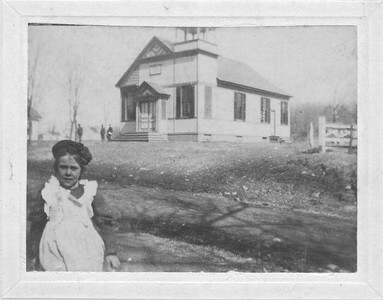 A young Annie Rhymer poses in front of Union's Town Hall building in the late 1800s. 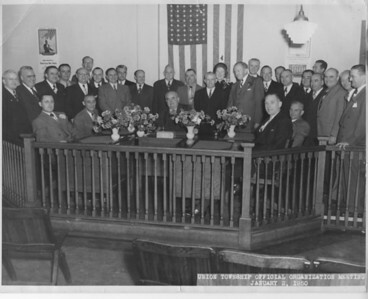 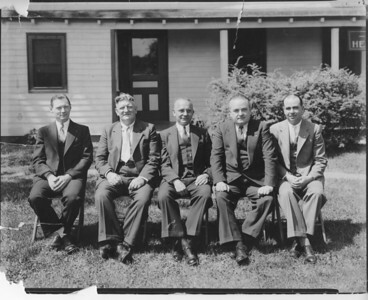 Township Comittee about 1935. left to right- Nelson Kieb, William Nothnagel, Mayor Charles Schramm, F. Edward Biertuempfel, Benjamin Romano. 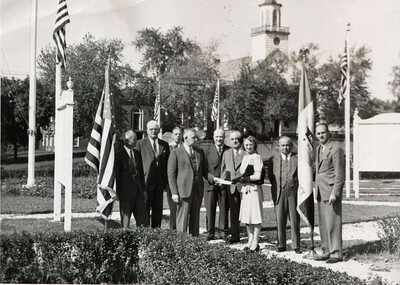 Photo taken in front of Police Station on Caldwell ave.
1939 Township Committee with other town dignitaries. 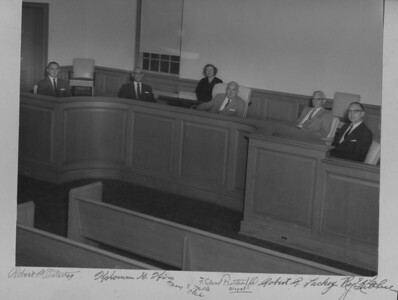 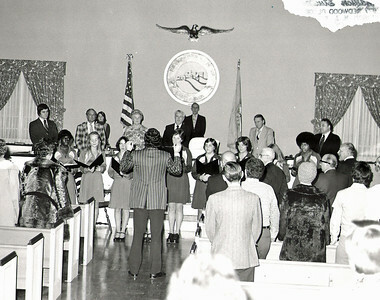 Township Committee in the brand new Municipal Building 1957. 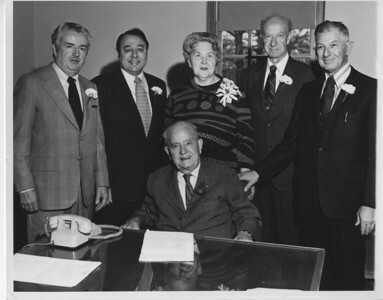 1950 Township Official Organization Meeting at Municipal Headquarters at 2004 Morris Ave.
Sal Mauro (left), Mayor F. Edward Biertuempfel and others . 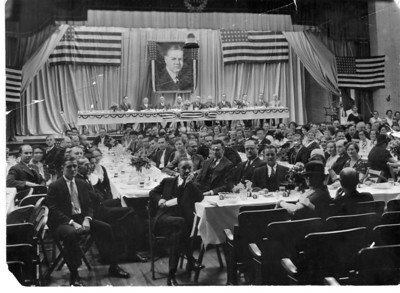 1929 dinner for F. Edward Biertuempfel Association. 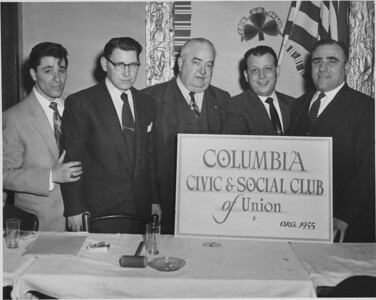 We would love to identify some of the people in this photo. 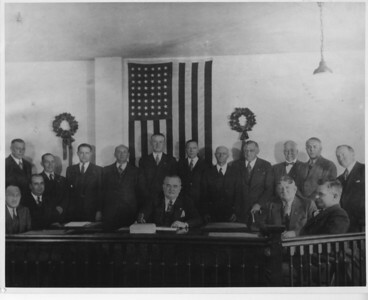 1932 Herbert Hoover Campaign event at Union High School. 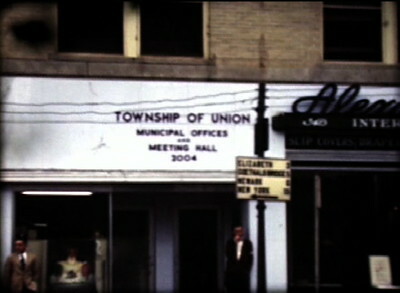 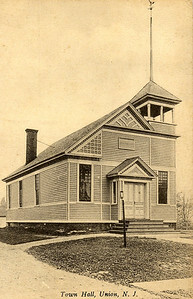 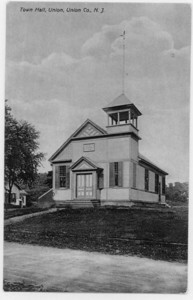 Before the Union Municipal Building had been built the Offices and Meeting Hall were located at 2004 Morris Ave. at the corner of Stuyvesant Ave. 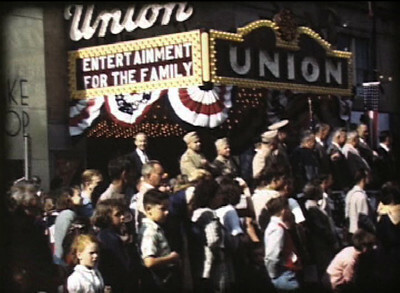 This image was taken from a film shot in 1948. 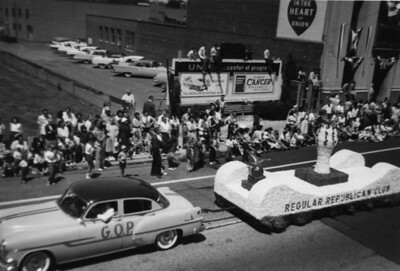 Regular Republican Club parade float on Morris Ave. being pulled by the GOP Mobile in front of the Union Center National Bank. 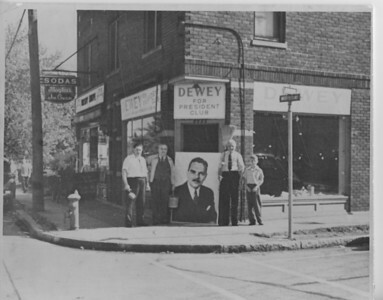 Mayor Biertuempfel and others in front of local Dewey for President campaign headquarters at the corner of Morris Ave. and Johnson Place in 1944 or 1948. 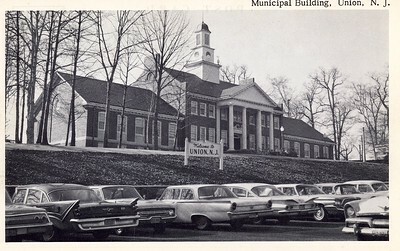 This building was recently torn down and the location is currently a vacant lot. 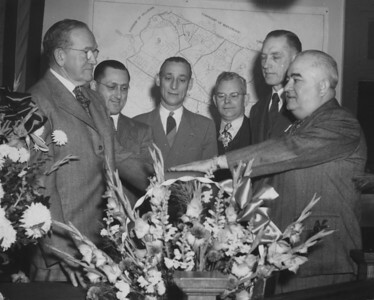 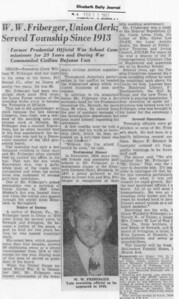 L-R, William Friberger (township clerk), Robert Ostertag, Koloman Kiss, Robert Lacky, Joseph Kitchell, Mayor F. Edward Biertuempfel, Reorganization Day late 40's.